Kant's subjectivism opened the door to the acceptance of contradiction. Often erroneously classified as part of the Enlightenment, Immanuel Kant (1724-1804) is in his mindset entirely antithetical to the values of that movement: he is a typical religious totalitarian who laid the groundwork for full blown subjectivism, the concept of mankind as the ultimate collective under a One World Government and anti-moral altruist ethics. Kant does not have the mind of a scientist, but of a religionist. The revered Kant can only have come to his philosophical tenets with fundamental intellectual dishonesty. He legitimized this, declaring that it was "necessary to deny knowledge in order to make room for faith". The end justifies the means! His 'trick' was to stretch reason beyond the limits of common sense and then used the outcome to discredit reason. It culminated in his "Critique of Pure Reason ". Postmodernism has made it its own, and applies it in every argument. 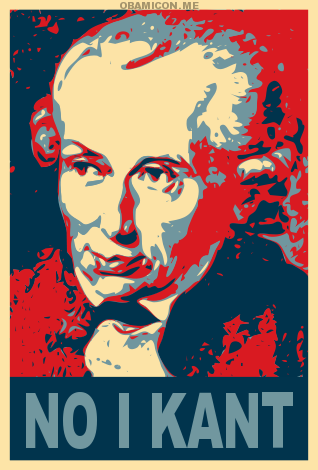 Kant was an austere Lutheran Pietist and a great admirer of Rousseau. The individual to him represented little more than a miserable sinner in need of a strong master, only good as cannon-fodder to teach him some morals. Kant foresees in a teleological progress towards an end-game by means of strife, war and discord. This supposedly brings man as a collective species to a more ethically evolved order. The process will ultimately culminate in a world government, an international and cosmopolitan federation of states, awaiting the coming of the Day of Judgment. This is the Hidden Plan of Nature, according to Kant. He was however more honest then today's postmodernists, admitting that his vision might in the end lead to the greatest tyranny imaginable. You think?! Progressivism and the new world order, anyone? The UN? The EU? The new empires that are emerging under the cover of free trade? While the thinkers of the Enlightenment worked towards the separation of Church and State, the philosophers based on Rousseau, Kant and Hegel -- even the atheists -- replaced God as the center of the Universe with ideal societies under the state, now synonymous with totalitarian dystopias . The tenets of the Enlightenment were abandoned and replaced with philosophical principles reflecting mysticismn: realism made way for idea-lism; collectivism replaced individualism; intuition and revelation were adopted as sources of knowledge rather than reason and experience; social theories replacing liberal capitalist theory. While today's postmodernists are mostly virulent atheists, they are at root adept followers of Rousseau, Kant and Hegel, faithfully subscribing to their most irrational tenets. Plato's mind versus body dualism, reflecting the macro and microcosm of heaven and earth tends to identify the mind with the soul, giving rise to visualizing the mind as non-physical pure substance, distinct from the physical organs and brain. Rather then thinking of them as tools to knowledge, this led to a view that the senses and the brain are obstacles to knowledge, obstructing the mind from external reality. Moreover, some sensorial imperfections (color blindness, for example) in some people, induced Kant to declare the senses unsound tools to knowledge overall. To clarify the Kantian position on the separation of the mind from reality Objectivist philosopher Stephen Hicks in "Explaining Postmodernism" makes a feminist analogy: to support Kant is to say that women are absolutely autonomous and free to do as they please, as long as it is within the confines of the kitchen; Kant imprisons the mind in the skull and isolates it from reality. "Once reason is in principle severed from reality, one enters a different philosophical universe altogether." According to postmodernists 'the' truth as 'a thing in itself' (according to Kant) does no longer exist. This statement's first victim is the notion of good versus evil, in fact, morality itself. Kant also held that reality conforms to reason, not vice versa: as by magic, thought has become the source of reality, instead of reality providing the mind with information. This marks the infamous shift from objectivism to subjectivism. It beggars the question, if I die overnight, will the sun rise tomorrow? It sparked Einstein asking the famous question: "Do you really believe that the universe does not exist when you are not watching it? Up next: in Part 4: "Heckling Hegel": "Hegel's theme was the state. Freedom is not God-given as the followers of the Enlightenment held, but a privilege granted by the state".